In this article we break down the real numbers. You will see the typical dealer costs, retail pricing and what you can expect to profit. While these numbers will vary depending on a number of factors (geographic location for example), you should walk away with a solid understanding of Ackland Media Frames enormous earning potential. The Changeable Wallscape we will discussing today was a 9′ x 50′ graphic, installed on a block wall surface. It was purchased from and installed by a local sign shop for a used car dealer in California. The installation crew consisted of 2 men and 1 Bucket Truck (not mandatory). These installers had no special training or particular certifications as none are needed for Ackland Media Frames installation. In fact, there are no special tools required for tensioning or special finishing on the vinyl banner. Two-piece Aluminum Ackland Media Frames were used with raw edge 13oz. Vinyl. The retail price invoiced to the car dealer was $5290. Included in the price was the frame, banner and professional installation. As I mentioned above, Installing a changeable banner frame presents a real opportunity for future repeat business. Depending on the nature of your client’s message, you can count on the fact that they will need to update or replace the graphic down the road. The great thing about installing a frame is no one likes to see it empty. So lets take a look at what future change-out revenue may look like. In the car dealer’s case the retail price for a change-out would be $1780, (cost = $788). That’s a great deal for your customer because it costs only 1/3 of the original price of the sign. It happens to also be a great deal for the sign shop because there is no frame cost incurred and it takes less then half the time to install. The profit amounts to 65% of the selling price on the repeat orders, which almost always keep coming! Win, win! As you can see by the numbers, Changeable Wallscapes present an excellent opportunity for any Printer or Sign Shop to generate healthy profits. The low investment paired with the relative ease of install make this product even more attractive. Finally, the repeat business opportunities feel like icing on the cake, giving you every reason to consider adding this product to your catalog. 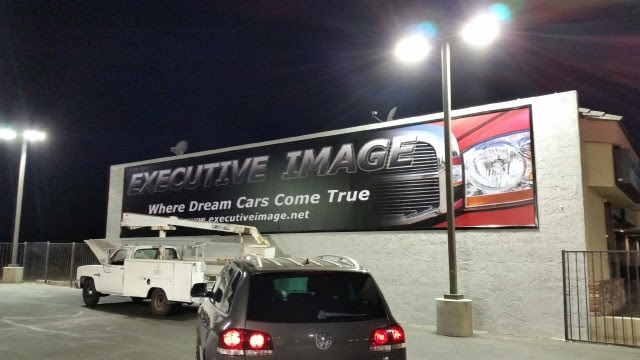 One last thing I would like to mention: After this job was complete, the car dealer was so happy with the outcome they soon ordered another Wallscape for the same location measuring 4′ x 50′, Considering there was NO money spent to acquire that extra job, that sounds like free money to me. Who doesn’t like FREE MONEY?